Product Administration Forum [CE12]Assign Main Task? I'm not sure whats going on with this one. At home when I configured my CONNECT installation to use my V8i tasks everything showed up however I am in the office today and have done the same yet my Main Task is showing the default Main Task and not my own. I've gone into my dgnlib where the task is configured but there is no option in the Customize dialog Properties section to allow me to assign the Main Task. Where did you place the dgnlib? Yes the file is within a folder that MS_GUIDGNLIBLIST points to. 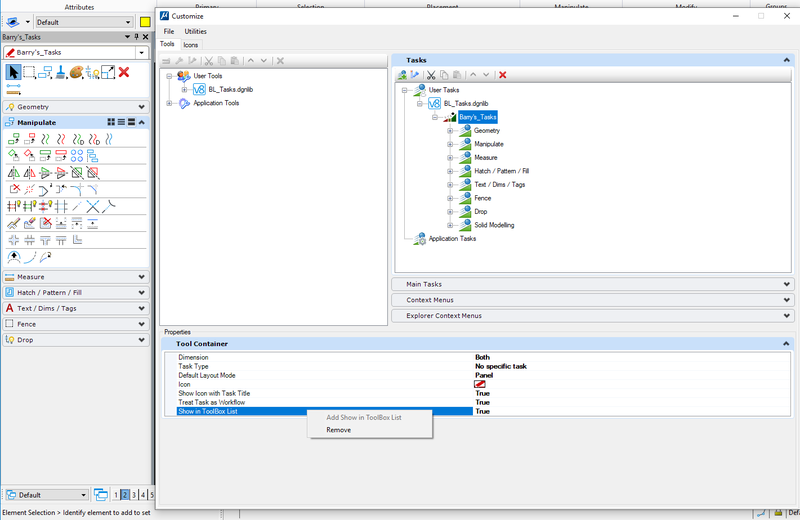 The below image shows that it is NOT possible in CONNECT to assign a main task nor any other property with the exception of 'Show in Toolbox List'. Any update on this Bentley?